Country Lifestyles Mobility is a small family company with over 40 years experience. We are main agents for all the leading makes of scooters, powerchairs, manual wheelchairs, walkers, beds and many other aids. If an item is available free from the National Health or Social Services we will advise that this is the case. Our staff are trained to be able to advise on the suitability of a product. If we are not certain, we will say so. We are fully conversant on the operation of the products. We enjoy serving our customers. We do not guarantee always to please but we do guarantee always to try. We hope we will give the information you need to make a wise choice. Be assured that if you telephone for information, we will not try to persuade you to have a demonstration or place an order. We are of the firm belief that time should be taken in making a choice. We are happy for customers to make as many visits as they wish to see the machines. We are happy to bring machines out to your home. If necessary we will borrow demonstration models from manufacturers for you to see. If you can have friends or relatives with you, it is always helpful. The more the merrier. We offer not only sales but also carry out all our own servicing whether at your home or in our workshop. We use manufacturers who are well established and hold spare parts for the products they sell. Some of the most well known machines are also not the most reliable. Reliability is the most important requisite and whilst anything mechanical can, and will, go wrong the difference between machines reliability can be vast. 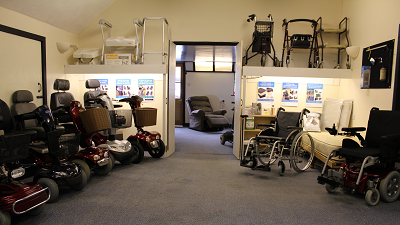 Here at Country Lifestyles, we have a variety of scooters, powered wheelchairs, manual wheelchairs and other aids in our showroom. 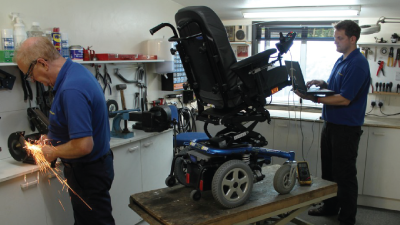 When purchasing mobility products we understand that people want sound advice on all aspects of their purchase, it is important to us that you really feel comfortable with the product that you are buying. Customers may book machines in for servicing or repair in our workshop. Country Lifestyles appreciates that coming to us may not be the best option for you so we have invested in a mobile servicing vehicle which can service your machine anywhere in Kent. Our call out is £60 which includes up to 1 hour on site. 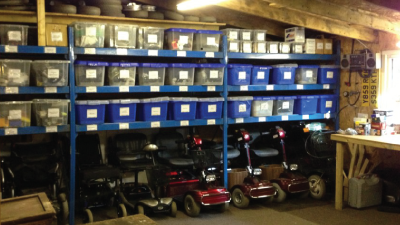 We are constantly surprised how few mobility companies hold basic spare parts such as batteries, tyres and tubes. These machines are often a necessity not a luxury so we try to keep spare parts for machines in order to keep our customers mobile. We belive this is all part of the service.